There are generalities and norms we have all come to know and accept at DSU as truths. But, are these truths fact-based, or are they just truths formulated by the experiences many students have had at DSU? I am here to debunk the myths that many college kids go through not only at DSU, but college in general. Myth #1: “I should get a blue parking pass if I live on campus, and a green parking pass if I live off campus.” Yeah, I’ve been there, too. Scrounging for a blue spot close to my residence hall, but like many a time, I am forced to park in green and walk blocks back to my room. This year happens to be my first year off-campus, and I considered getting a green parking pass- until I saw that they were full every day when I came to campus to class. It was much easier and a time-saver to park on the side streets in front of Kennedy Center and Beadle Hall. Is a parking pass worth the money for you? It may be, if you are one of the early and lucky ones to grab a blue or green parking spot every day. But if you experienced the anxiety of almost being late to class or work on campus, because you couldn’t find a green/blue parking spot, it may be wise to opt out for parking on the side streets. Use your best judgement, and decide if the hassle is worth the money for the passes. Myth #2: “Everyone gains a freshman 15. I can just lose it my sophomore year.” You may start the year out with good intentions of eating salads and fresh fruit and vegetables on your meal plan, and using your free swipes (you paid for it in tuition) at the Community Center to exercise, but if you are like most college students, you will likely fall into a groove of pizza, ramen noodles, movies/Netflix and homework parties with your friends. The good news? You don’t have to fall into that unhealthy cycle! Ask those same friends to start going with you to the gym a few times a week. You can ACTUALLY choose to eat just a salad on your meal plan. (You’ll feel much better afterwards versus if you ate greasy food.) It’s simply just mind over matter. You can keep a healthy weight in college by making small, daily healthy choices. They add up, and the weight won’t! 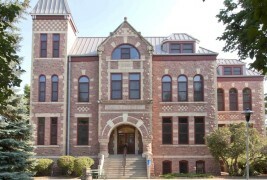 Myth #3: “Beadle Hall is haunted!” As a worker in Beadle for three years now, I can assure you, even when I was in the building all alone for hours at a time, I have never seen or heard anything paranormal-like. Although, I have had friends with after hour access tell me some personal horror stories of their late-night project nights in the computer labs of Beadle Hall. They involved hearing footsteps and laughter in the hallway. I guess this myth is up to the reader to debunk for themselves! Regardless, Beadle Hall is a rich and historic place that deserves to be admired and appreciated, no matter who or what dwells inside its walls. Myth #4: “There’s nothing to do in Madison.” There is a quote that states, “Only boring people become bored.” If you take offense to this statement, it’s time to change that. When it comes to small towns, one must be creative when thinking of things to do off-campus. Luckily, Madison is a small town with plenty for students to do. The lakes offer trails to hike on and disc golf. The many parks in town have soccer fields and basketball courts. There are plenty of restaurants and shops on Egan Avenue to explore during your down time. Madison also features a movie theatre, a new shop with golf simulators, an actual golf course, a bowling alley, etc. Have fun exploring! I could think of plenty of more myths present here at DSU. But for the sake of time and sanity, I cannot list them all. It’s up to you as the reader to now challenge what you know as truths and myths at DSU, and decide whether or not you really need to live by them. Nanocon – South Dakota’s biggest gaming convention is almost here!